Agricultural Auto Lube Systems: FLO Components – automatic lubrication systems, centralized automated greasing systems, autogreasers. – FLO Components – Automatic Lubrication Systems Specialist in Ontario and Manitoba. 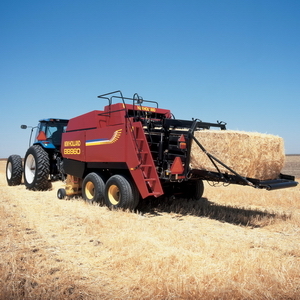 Agricultural Auto Lube Systems: FLO Components – automatic lubrication systems, centralized automated greasing systems, autogreasers. 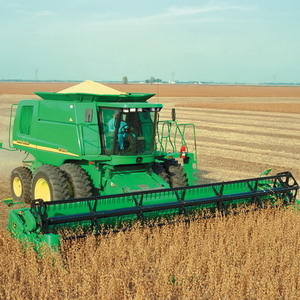 Agricultural applications are unique in that equipment runs 100% consistently for days on end followed by long periods of inactivity. During the operating period, every minute counts. 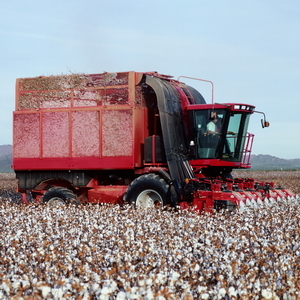 Operators are under significant time pressures and are constantly revising schedules to fit machine and operator availability plus crop and weather conditions. Greasing on the move provides additional flexibility to meet changing conditions by saving you an average of 30 minutes greasing downtime per eight hour shift. Bearing failure resulting from improper greasing is a major cause of equipment downtime and significant unnecessary maintenance costs in today’s environment. The majority of failures are caused by: contamination of bushings by dust, dirt and moisture; inadequate amounts of grease applied to bearings; or over-greasing of key pivot points. Direct costs resulting from inadequate greasing can include: replacement bearings; labor to repair or replace bearings; lost time and its impact on productivity. Indirect, but very real costs include: wasted grease, environmental issues and safety or housekeeping issues. Reduces operator involvement = Keep your operators focused on their primary job. Improves safety = You don’t have to climb over and under equipment to grease. Productivity, availability, operating costs and utilization show a significantly greater impact on your bottom-line profitability. As you are well aware, these are the key factors affecting your profit every day that you operate your machine. Resale value, interest rate and purchase price have a longer term effect since they are mainly a one-time impact. Completely reliable and fully automatic, a FLO central greasing system will increase your component life, overall productivity, availability, operating costs, utilization and resale value. The greasing system dispenses small measured amounts of grease at frequent intervals while your equipment is operating, maintaining a consistent grease seal to prevent dirt and contaminants from migrating into bearings. The fully installed Automated Greasing System consists of the Quicklub® pump, SSV positive displacement metering valves, fittings, tubing and hose. An integrated adjustable timer built into the pump provides flexibility to quickly adjust grease frequency. Grease delivery to bearings is monitored by the visual cycle indicator pin on the grease distribution block. Optional cab-mounted low reservoir level light and system monitor lights are available. With the development of the QLS series of Quicklub® Greasing Systems, automated lubrication has never been/more affordable. Reliable and fully automatic, this family of compact systems supplies up to 18 lubrication points using either an NLGI #2 grease or oil. This self-contained system is supplied complete with a 12/24 VDC pump, control/monitor unit and lubricant metering device. Compact and easy-to-install, it features an integrated circuit board which controls lubrication cycle times and monitors the system to ensure each lubrication cycle is completed. The standard low-level indicator even tells you when to fill the reservoir, ensuring the pump never runs empty. The housing of the system is NEMA 4 protected to handle high-pressure wash downs. Our Solutions include all of the parts you will need to install your system. Installation of the pre-assembled unit is quick and easy. 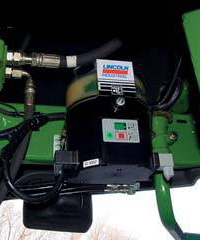 Simply fasten the QLS greasing system to your machine, connect the flexible tubing to your bearings using our Quicklinc™ connectors and wire the unit into an electrical accessory outlet. Set the time interval, fill the reservoir and you are ready to go. Keep your equipment out on the job and making money. Contact us now to find out how small an investment is needed to start saving money and increase productivity.